Somewhere out there in fantasyland, a team owner is going to lose his league by a couple of saves — maybe the result of Francisco Rodriguez losing his temper, assaulting the father of his girlfriend, suffering a torn ligament in his thumb, and hitting the injury shelf for the season. Those who play fantasy baseball are accustomed to fickle closers and the sometimes-aggravating, sometimes-fun pursuit of saves. Few of us, though, could have ever imagined a scenario this bizarre. The xFIP formula doesn’t account for off-the-field commotion. On the optimistic side, somewhere out there in fantasyland, a team owner will win his league by a couple of saves — perhaps the result of a new job opportunity for new Mets closer Hisanori Takahashi. On Monday, he notched his first save, and afterward, manager Jerry Manuel tagged him as “the guy” going forward. He pitched a perfect 1 2/3 innings on Wednesday, further solidifying his role. Takahashi is being picked up in many leagues with tight saves races. Can he keep the job? The season has been a strange one for the Japanese import. In April, the 35-year-old was an effective reliever in the middle of the Mets pen. Despite never having a particularly strong strikeout rate in Japan, Takahashi mastered American batters that month to the tune of 21 strikeouts in 14 innings. Credit an extremely odd pitch called the “shuuto” for Takahashi’s sudden emergence on the scene. In late May, Takahashi was then switched into a starting pitching role. His first two starts were impressive. He shut out the fearsome New York Yankees. He then shut out the imposing Philadelphia Phillies. So far, so good. In June, the wheels came off. He allowed six earned runs in four innings in the pitchers’ haven known as Petco Park against the San Diego Padres. He followed that up by allowing five earned runs in five innings to the Florida Marlins. Ever since then, he’s followed form by being at times fantastic, and other times atrocious. Truth be told, there are some statistics that support the idea that Takahashi can hold the closer gig for the rest of the season. As a starter, his ERA is 5.01 with 54 Ks in 64.2 innings. But as a reliever, his ERA is 2.68 with 42 Ks in 37 IP. He’s clearly been more effective in the latter role. On the other hand, regardless of Takahashi’s skills, he’s proven himself a bit unstable — not a good quality for a closer — plus he’s 35 years old and pitching for a team that’s fairly close to being mathematically eliminated from playoff contention. Given the Mets’ place in the standings, the wise move for them to try Bobby Parnell out as closer. Parnell doesn’t have a “shuuto” pitch. Instead, he has a fastball that averages 96 MPH and has been known to reach near 100 MPH. Parnell is only 25 years old and is having a great season with 22 strikeouts to only 6 walks in 22 innings. He could easily be the Mets’ closer-of-the-future, a distinction that may mean something if the Mets are truly serious about voiding the rest of K-Rod’s contract. For this reason, as a fantasy owner, we’d probably hang on to guys like Bobby Jenks or Jonathan Broxton — temporarily out of jobs as closers of the White Sox and Dodgers, respectively — before adding a newcomer like Takahashi. Then again, would it be shocking if Takahashi sticks these final weeks and leads some fantasy team to a championship? Of course not. In New York, clearly anything is possible. Hisanori Takahashi and The Shuuto: Fantasy Buy? Fantasy baseball can be a fickle beast. Take the case of Hisanori Takahashi on the Mets. First, he was a 35-year-old veteran of the Japanese leagues that had never pitched more than 150 innings in a season, never struck out as many as one batter per inning (a feat Colby Lewis and numerous other dominant Japanese league pitchers have managed), and didn’t come with a ton of buzz. It seemed that the Mets were happy to use him as a LOOGY, as they stuck him in the bullpen despite Rod Barajas‘ claim that he was a “Number 3 starter” after catching him in spring training. Fast forward to the first month of the season, and Takahashi was doing fine, but wasn’t interesting to most fantasy players as a middle reliever. Then John Maine went down with an injury and Oliver Perez went down with a case of Oliver-Perez-ness, and suddenly Takahashi was thrust into a starting role. It was what Takahashi was used to, and he blossomed at first. Two starts in, Takahashi hadn’t given up a run in 11 innings, and had even bested the mighty New York Yankees and Philadelphia Phillies. Fantasy owners went to the wire and picked him up. Many people had him in against the San Diego Padres – and then he was shelled for six runs in four innings. He followed that up with five runs allowed in five innings against the Marlins on Sunday. Now Takahashi is owned in only 12% of fantasy leagues and is probably on most waiver wires in mixed leagues. Will the real Takahashi stand up? The pitcher represented by the Bloomberg Sports Fantasy Tools spider graphs on the right is just barely fantasy relevant in shallow mixed leagues. Going back to Patrick Newman and his NPB Tracker to figure out more about Takahashi’s history, we delve into more mysteries. Take a look at the velocity tracker grab on the left. He’s got five legitimate pitches, most of which are usual in American baseball: fastball, curve, change, sinker and slider. The last, though? The shuuto. The shuuto is a legendary pitch in Japan and is hard to translate. Mike Fast, pitch f/x analyst extraordinaire, took a look at the pitch and recent literature on the subject and couldn’t definitely label the pitch. By all accounts, though, it’s a two-seam “cut” fastball – a tiny bit slower than a regular four-seam fastball, but with movement that bores to the left. It could just be another name for the cut fastball, in the end. Does that jive with what we can see in pitch f/x for Takahashi? 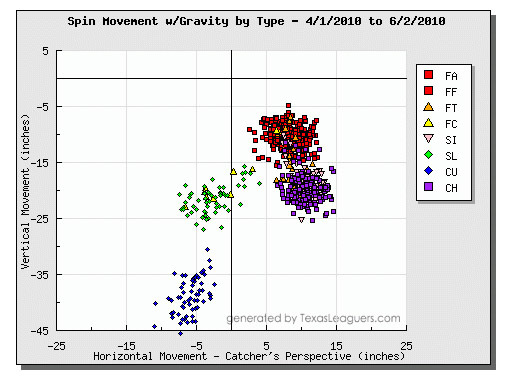 Fangraphs doesn’t have a pitch that seems to fit the description of a pitch with a similar velocity but different movement, but Texas Leaguers says that Takahashi throws a two-seamer 7.5% of the time. The two-seamer that Texas Leaguers describes crosses the plate at 81.5 MPH compared to his four-seam 88.6 MPH velocity, though, so it’s already a little different than most two-seamers. We know from Harry Pavlidis’ work with benchmarks for pitch types that the average four-seamer goes 92 MPH and the average two-seamer goes 91 MPH. If we move forward with the idea that the shuuto is what most would call a two-seamer, we realize that the pitch is probably not the key to Takahashi’s success. After all, the primary benefit from the two-seamer is the ground balls it entices. With a 52% groundball rate, the pitch is the most grounder-heavy pitch type according to Pavlidis’ work. Takahashi’s shuuto yields a poor 33.3% groundball rate. And he throws the pitch, at most, 7.5% of the time. Obviously, the classification systems are different. Newman stated that he thought Takahashi threw the shuuto very rarely in Japan, as his numbers show. Looking at his pitch f/x spin angle with gravity chart, we can see the four-seam fastball, the changeup, the slider and the curve pretty distinctly. The ‘shuuto’ or two-seamer might be those straggler dots in between the fastball and the changeup. Tightening pitch classifications will be a big step forward for pitch f/x, and will help us answer questions like these more definitively in the future. What we can tell now is that Takahashi throws a lot of pitches, and that his three main pitches – the fastball, changeup and sinker – all pound the strike zone at above-average rates (all above 65.7%, and average is ~60%). The changeup and sinker also get above-average whiffs (11.0% for the changeup, 25.7% for the sinker, 9% is about average. 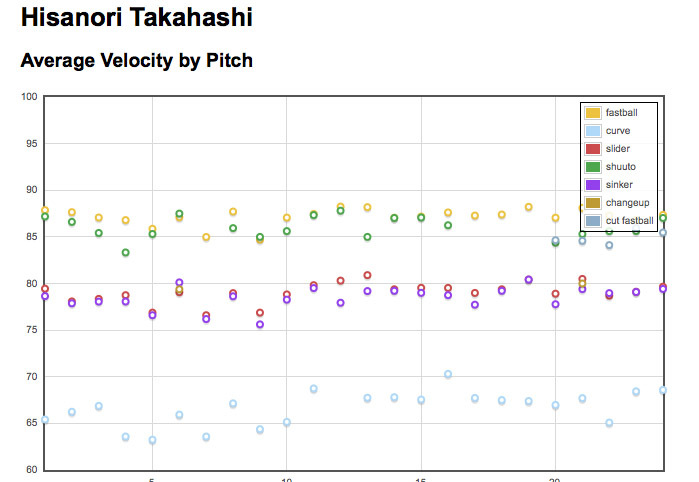 Conventional wisdom might lump him in with some countrymen, point out the hitch in his delivery, his large arsenal including the shuuto, the bad groundball rate, and the below-average whiff rate on his fastball (7.3%), and call Takahashi a novelty that will suffer once teams start scouting him better and seeing him more often. But as a lefty in a division with some nice parks for a flyball pitcher (0.499 park factor for home runs in Citi Field this year, for one), Takahashi has some things going for him. Shuuto or not, he can find the strike zone with multiple pitches and gets whiffs on his secondary stuff. At the very least, he is a good matchups play and a strong bench pitcher in any format deeper than a 10-team mixed league. 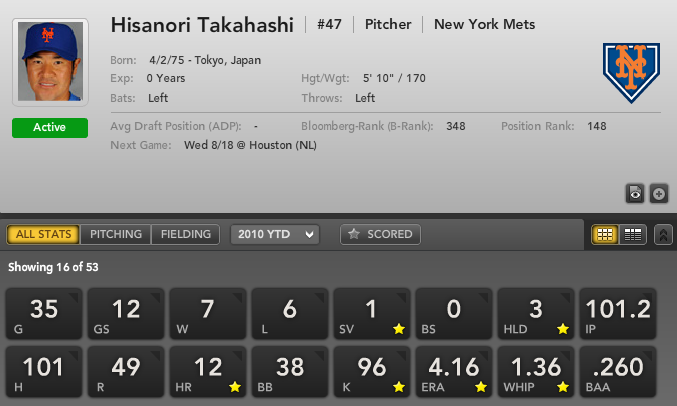 For more on Hisanori Takahashi and other waiver-wire pitchers, check out Bloomberg Sports’ fantasy kits.